I shall be away for the beginning of this year’s Retrochallenge, so in order to hit the ground running when I get back I thought I’d make sure all my machines were primed and ready for action. To that end I’ve recently sorted out the batteries in my PX-8’s and today my attention turned to my Commodore 128D. The machine is in pretty good condition, the cassette port is a bit flaky and the built in 1571 drive seems to read and write to disks reasonably successfully. My interest lies in using CP/M on the C128 and I really needed to secure a way of getting data into the machine in this mode. With third party software such as Juggler even more formats are supported. Armed with Big Blue Reader, the original CP/M system disk, a clutch of DSDD disks and my bridge machine running DOS and 22Disk I thought I was well prepared. However no matter which combination of disks and formats I use I cannot successfully format a disk with the 1571 nor the 1581. I’m pretty sure the disks are OK, they seem to work without problems with the Epson TF-20 and PX-8 and the 1581 and 1571 drives appear happy to do everything except format. 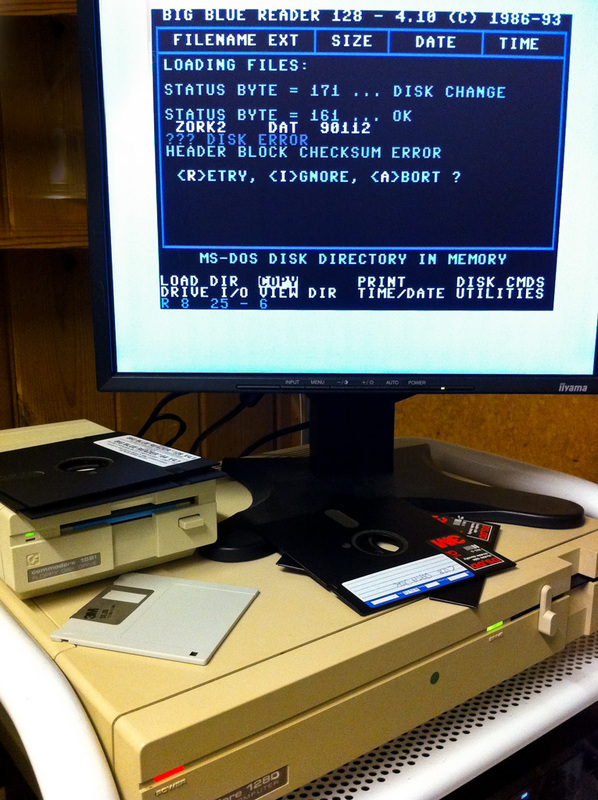 More in desperation than hope of success I put one of the disks that I’d formatted with the TF-20 and PX-8 in the C128, typed DIR. 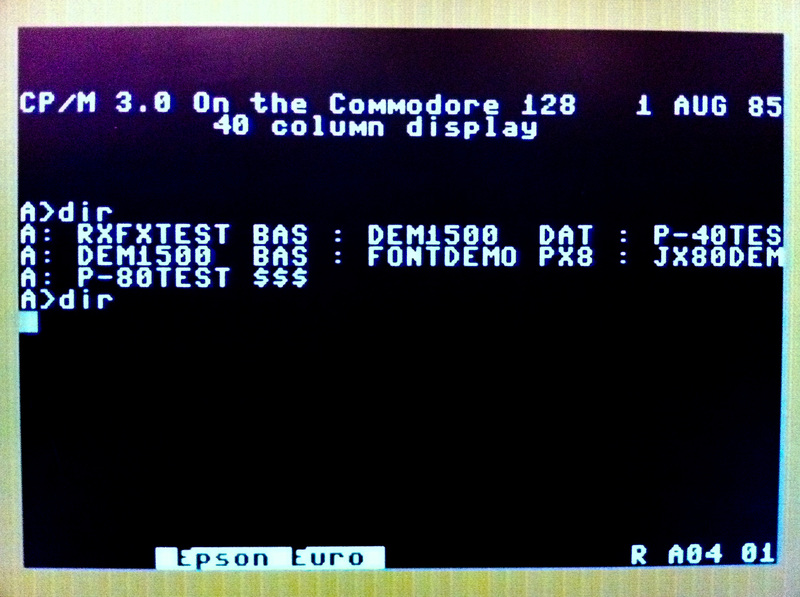 To my surprise and excitement the C128 came up with some text at the bottom of the screen reading Epson QX-10. I pressed return and the drive chugged away, thought about it for a while and came back with ‘No file.’ uh, there were definitely files on the disk. I had a search around and discovered that when the format description comes up at the bottom of the screen you can cycle through different options. So I tried again and using the right arrow key found the next selection was ‘Epson Euro’ I pressed return, the drive chugged away and up popped the disk contents, yipeee! 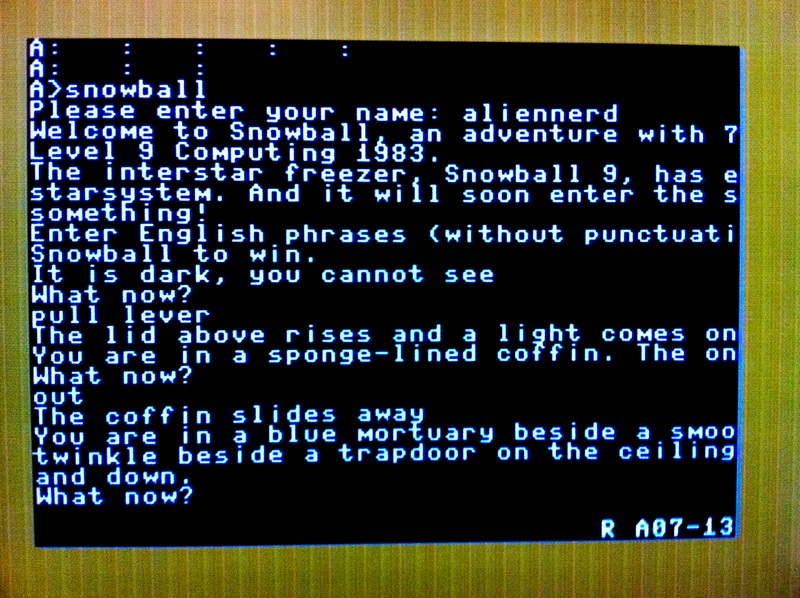 I loaded PIP quickly just to check it worked, which it did and I then formatted a fresh disk in the TF-20, copied the text adventure Snowball onto it and put it into the C128. On the first attempt I got a BDOS error but on the second attempt it loaded. So I now have a way of getting software downloaded from the Internet into the C128 in CP/M mode, albeit a somewhat circuitous route via the PX-8 but a way nonetheless. I currently have the C128 hooked up to an IIyama LCD panel via the s-video port which means I can only run in 40 column mode however I do have a cable that will allow me to connect via Scart and run in 80 column mode which I shall try next as much of the software I’ve tried assumes this mode. So now hopefully I’ll be able to get on with things as soon as I return, try some CP/M software on the C128, hopefully get it talking to the Epson PX-8 via RS232 and I have some unused 3.5″ DSDD disks on the way which I’m hoping I’ll be able to format successfully with the 1581. Guess urbancamo (http://www.wickensonline.co.uk/rc2011sc/) would love to have your TF-20, given this information: http://electrickery.xs4all.nl/comp/tf20/ Unless he likes cassette storage. Sounds like it works with the HX-20 too if you have a slightly different cable. Maybe you and he should get a modem to talk to each other… If you can make a two-player game might as well make it be able to be multiplayer. I wonder if you had two modems and some external buffer hardware for each if you could use both of them on the same serial port (probably easily tax the processor beyond working). The idea being that they can each maintain a connection if they’re smart modems, and if the queries to the computer are buffered, they can be handled one after the other in a loop. Of course, you’d have to hook one of them up to the internet using something like tcpser (http://www.jbrain.com/pub/linux/serial/) unless you have a second phone line. The TF-20 does indeed work with the HX-20 although I think Urbancamo was looking for something reasonably compact to take on holiday with him. The TF-20 feels like it weighs around the same amount as a 15″ CRT, it never ceases to surprise me how heavy it is when I have to move it! With the progress I’m making with the C128 in CP/M mode (not much) it’s looking as though my whole Retrochallenge may revolve around trying to create a reliable CP/M system disk for it. However having set up a quick two way chat program in BASIC between two PX-8’s via RS232 I may well go down the multiplayer game route instead. Your suggestion using modems sounds great but beyond my abilities I think. I could leave the tricky stuff to Urbancamo of course, ’twas ever thus. Well, I was going to suggest that it’d be interesting if you could share the drive with someone over a modem. That was when it occurred to me that you probably have only one serial port. That and you’d have to write some software to take commands from the modem and read from and write to the drive accordingly. Probably also a painful amount of work not to mention in need of more than BASIC likely unless you wanted it to be slow. That would however be very cool!